Kappa, arguably Japan's most well-known creature of legend, are mischievous river imps notorious for luring people -- particularly children -- into the water to drown and eat them. They smell like fish, enjoy cucumbers and sumo, and are said to be very courteous despite their malicious tendencies. Although kappa are typically about the size of a child and greenish in color, they can vary widely in appearance. They frequently have a turtle-like shell and scaly skin, but sometimes their skin is moist and slick, or coated in fur. Most walk upright on their hind legs, but they are occasionally seen on all fours. Regardless of body type, the top of the kappa's head usually features a bowl-shaped depression containing water. The water inside this bowl is the source of the kappa's power. The Edo period (1603 to 1867) saw some serious scientific literature devoted to the study of these creatures. Suikokouryaku (1820), for example, is a compendium of kappa-related information gathered from a variety of sources from Japan and China. The book, which is housed in the Iwase Bunko Library, includes kappa sketches by artist Kurimoto Tanshu. Here are a few. The kappa on the left, sketched by Ito Chobei, was captured during the Meiwa period (1764 to 1772) in Edo, somewhere in present-day Tokyo's Edogawa ward. 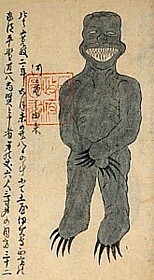 When the creature was shown to Ota Chogen, a noted herbalist of the time, he identified it as a kappa -- he happened to have a kappa sketch with him that showed a creature with strikingly similar features. According to the text in the book, this kappa measured 60 cm (2 ft) tall and had slippery skin like that of a catfish. The middle picture above shows a type of kappa with no shell, and the picture on the right shows a kappa that was caught in a net in Mito, Japan in 1801. This kappa had a prominent chest, a crooked back and three anuses. Later in the Edo period, an illustrated guide to 12 types of kappa (Suiko juni-hin no zu) was produced based on information taken from Suikokouryaku. A portion of this document is shown above. Check out the complete, high-resolution version here. Ito Keisuke, a well-known man of medicine and prolific natural history artist in the Edo period, sometimes included depictions of mysterious creatures with his animal drawings -- like the kappa on the left above, for example. The middle picture shows a kappa that was observed in one of the moats around Edo castle in the late 18th century. The picture on the right shows a kappa observed in the early 17th century in what is now the city of Hita in Oita prefecture (Kyushu). This kappa looked sort of like a turtle standing on its hind legs, and it had a depression on its head, webbed fingers, and splotches on its chest and abdomen. The neneko (or neko) kappa, shown on the left above, was sketched by Akamatsu Sotan in his 1855 work entitled Tonegawa zushi ("Illustrated History of the Tone River"). This kappa was known to move to a new location along the river each year, causing trouble wherever it went. 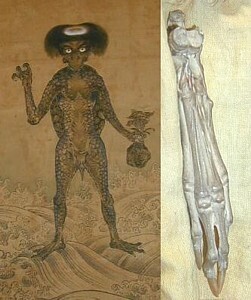 The image on the right shows a kappa scroll and kappa hand belonging to Sougenji (a.k.a. Kappa-dera, or "kappa temple") located in the Ueno-Asakusa area of Tokyo. The temple is one of countless places in Japan that has stories and legends of kappa associated with it. According to this temple's legend, the surrounding area was once a basin with poor drainage, making it prone to flooding. A local raincoat maker (the Japanese word for "raincoat" is "kappa") took it upon himself to construct a series of drainage ditches, which he was able to complete with the help of a kappa living in the Sumida River. It is said that people fortunate enough to lay eyes on this kappa were blessed with success in business. For lots more background information and kappa links, check here. Great post. I think I've actually posted most of those images before but had not teased out the back story. Cheers. Was it through you, that I had come to this "modern" treaty of how to raise a Kappa? before this i have seen a true form kappa, he was walking in the jungle and someone has take picture of that creature and i'm not sure where the picture right now, as far as i know the picture is true and came from japan and some article said that they really cleaver in madical field.. 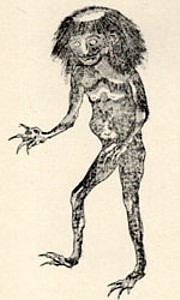 I first heard of the Kappa creature when it was mentioned in one chapter of the Detective Conan manga I was reading and it turns out that this creature could have possibly existed. I'm interested in knowing it's nature and origin. A very interesting post. Thank you for sharing! Kappa: Japonlar?n Milli Canavar? | Avam Kamaras?